The Tenants Information Service (TIS) is delighted to announce the winners of the 2013 Frances Nelson MBE Award as North Lanarkshire Federation and Onthank Tenants and Residents Association for their contribution to bringing about change in their local communities. The awards were presented by Councillor John Alexander, the Housing Convenor of Dundee City Council, at the TIS Annual Conference Gala Dinner on the 1st June. This year, TIS received more nominations than any previous year for the Awards, which recognise exceptional achievements and contributions towards the tenants and residents movement. 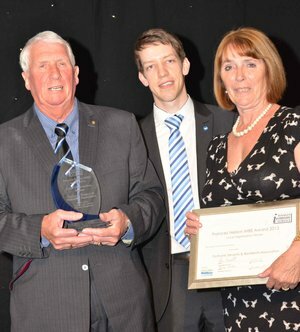 There were numerous high quality nominations for the awards, however the judges chose North Lanarkshire Federation as the winner of the Umbrella Organisation Category for the work of the Federation’s Motherwell Towers Sub Group, which has been significant in improving communications between the Council and local tenants. Both the Sub Group members and the Federation have demonstrated that with patience, understanding and a shared vision similar to the belief held by Frances, that ‘everyone is entitled to a decent home’ and that it’s crucial that ‘tenants can influence decisions about their housing service and standards’. Their grass-root tenant involvement and tenant participation ensures that tenants are at the heart of the decisions that are made about where they live. Onthank Tenants and Residents Association walked away with the award for the Local Organisation category. The organisation has developed a garden care scheme in partnership with the CVO and local companies. This project impacts the visual appearance of the community and benefits every member of that community as volunteers and modern apprentices deliver garden care to tenants and residents who cannot do their own gardening for reasons such as health or lack of access to the necessary equipment. The CVO have recently announced that they are looking at rolling this project out to all areas of East Ayrshire. West Lothian, and East Lothian Tenants and Residents Panel were runners up for the Umbrella Organisation Category. The runners up for the Local Group Category were are East Knightsridge Tenants and Residents Association and Nungate Tenants and Residents Association. TIS would like to thank Dundee City Council for sponsoring the Frances Nelson MBE Award 2013. Keep an eye on the TIS website, where we will be uploading the photographs from the Annual Conference in the next few weeks – including those from the ‘photo booth’ which took place on Saturday evening.